Purchasing a car or truck isn’t a decision to be made lightly. In a way, your vehicle will become virtually a member of the family—it takes you to and from your worksite, your parties, your vacations, and other important functions. Naturally, it’s a good policy to keep your vehicle in the best possible condition, but, for many consumers, this seems to be easier said than done. It’s all too tempting to slack off on important maintenance tasks—either to save money, or simply because it seems unimportant, but this negligence can severely shorten the lifespan of your automobile by prematurely wearing out vital parts and components. What’s more, this problem is avoidable. Proper car maintenance isn’t terribly complicated, and it really pays off in the long run. Here’s a brief overview of the most important vehicle maintenance issues you need to know about. The first step in your vehicle maintenance program is to learn about the car or truck that you drive. One easy way to accomplish this is to read the owner’s manual that was so helpfully included with the purchase of the vehicle—but this is exactly what so many consumers fail to do. It’s not necessary to memorize every fact or figure associated with your particular model, but there are some important maintenance questions that can be answered simply by opening up this little book. Does your manual recommend premium gasoline for best performance? How often does it suggest changing certain parts? Is it possible to use tire chains without damaging the vehicle? You should know the answers to these questions. If any of the advice on this page conflicts with your manual, then the manual should be considered the more accurate authority. Replacing your oil on a routine basis is easily one of the most important maintenance tasks you must carry out. For years, the standard advice was to change the oil every three months or 3000 miles, whichever came first. Nowadays, however, this old recommendation is considered obsolete, much to the dismay of auto shops that traditionally cashed in on these frequent oil changes. The average driver can probably get away with an oil change every six months or 7500 miles. Keep in mind, though, that this recommendation assumes normal vehicle use. If you regularly drive in harsh conditions, or even experience just a lot of stop-and-go traffic, you will need to change your oil more often. 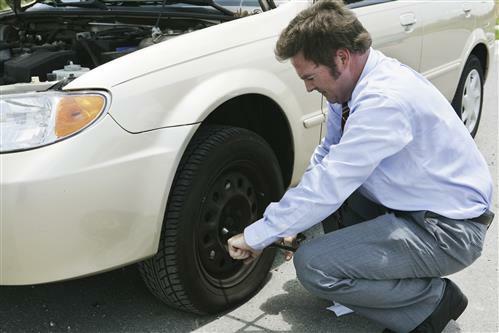 Rotating your tires regularly will ensure that normal wear to them is distributed evenly. A good target for this procedure is every six months or 6000 miles. Hot or cold weather can cause your tires to become under-inflated, resulting in poor gas mileage and even a serious safety hazard. Check your tires every month to ensure that they’re properly inflated; for best results, you should do this before driving the car, as the heat generated by motion may skew the reading. The air filter keeps dirt and other kinds of debris from harming the engine, and over time this device will need to be replaced. Aim to get another filter every year or 12,000 miles—but harsh driving conditions will require more frequent changes. It goes without saying that the brakes should be properly maintained for safety. Check the pads every six months to ensure that they haven’t become too worn. The more you use your wipers, the more frequently you will have to change them. Keep in mind, however, that your wipers sustain wear and tear even from ordinary weather conditions. For the average driver, it’s best to replace these every year. Regular Car Maintenance is essential to maintaining a fully functional vehicle. Take a course on car maintenance with us today!